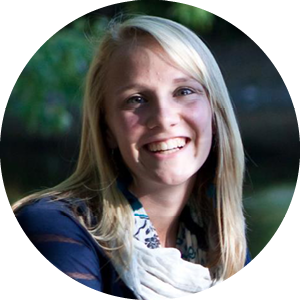 Kelly started with Cultivate in its first semester in 2013 as a freshman at Oakland. Coming from a missionary family, Kelly knew a lot about her faith, the bible, and the importance of reaching out. However, even with an incredible family, she still had her obstacles to overcome. A fear of missing out on God’s promptings for her life was one such obstacle. As a successful student-athlete in high school, Kelly had a plan and direction for her life, but she was afraid of one day waking up and thinking she had missed or left God’s plan some place in the distant past. As a new freshman living away from home for the first time, this fear was fierce; still, she wanted help to put God first in her life. In a divine connection, Kelly became connected with the Cultivate team. She was befriended, prayed over, and joined a women’s group. She participated in twice weekly faith discussions, and began to pray significantly on her own. In her second year, she began a relationship with a female mentor who she still spends time with 4 years later as she does her graduate study at Oakland. She looked around campus organizations to see where she could be of assistance. Kelly began to grow, and as a result, started to become a kingdom worker, desiring to serve others to show them the love of Christ. As a student-athlete at Oakland, Kelly formed relationships with members of her track team, and became a part of Fellowship of Christian Athletes. During her junior year, she launched her first small group, inviting in several athletes who lived in her residence community on campus. One of the young women she invited was struggling deeply in her faith, but Kelly continually encouraged her, even when it meant late nights or difficult circumstances. Two years later, that same young woman has rekindled her relationship with Jesus. Kelly has encouraged dozens of students in her time at Oakland. From roommates, to friends, to athletes, Kelly is always looking for ways to grow God’s Kingdom in the hearts of others. Every summer from 2015-2017, Kelly has served as a leader on a local SpringHill Day Camps team in metro Detroit with other Oakland students, working primarily with special needs campers. Beginning in fall of 2016, she became president of Fellowship of Christian Athletes, working to establish and build up a faith community amongst Oakland athletes. In April 2017, she led an initiative to bring a worship concert to Oakland’s campus in an effort to unite various Christian organizations, and even now as a graduate student is investing in undergraduate students to help start new sport-specific small groups. She is a kingdom worker now, and we trust she will continue to be in the future wherever God takes her.